Israeli soldiers target a Palestinian photographer who was taking pictures of them invading Aida Refugee Camp, shooting him in the face with a rubber-coated steel bullet. At about 5:30 p.m. Monday, Israeli soldiers entered Aida Refugee Camp through a gate in the separation wall dividing Rachel’s Tomb from Bethlehem. There were no clashes at the time, and their presence in the camp was not provoked, but was itself a provocation. Mohammad Al-Azza began photographing the advancing soldiers from the second-floor balcony of the Lajee Center, a children’s center near the camp entrance where he has long volunteered in the media unit. He was eager to use the center’s new camera, a Canon 600D with a 50-250mm zoom lens. The soldiers, who became angrier continued threatening Mohammad with their guns. Mohammad decided to go inside, but continued taking photos through the window and through the doorway opened just wide enough for his camera lens to fit through. By this time, a few youth from the camp were throwing stones, while the soldiers fired rubber-coated steel bullets and tear gas grenades into the camp. 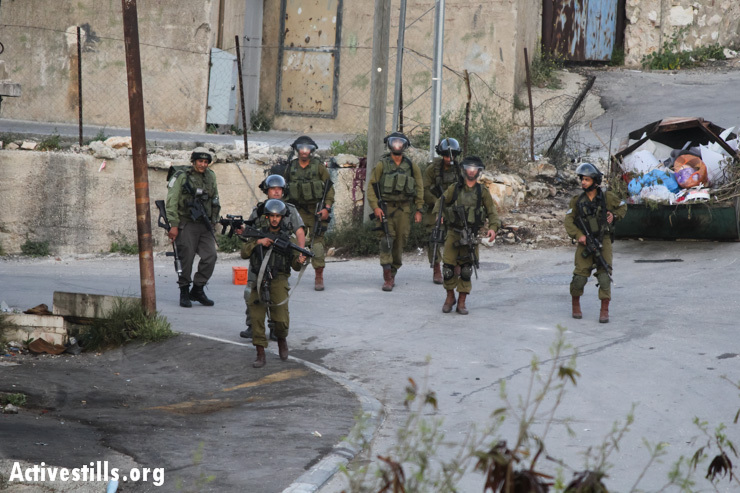 However, with many arrests and shootings by Israeli forces in the camp in recent months, the response from camp residents was smaller than usual. Two children in the Aida Camp have been shot with live ammunition by Israeli forces in recent months, one of them fatally. About 10 minutes after Mohammad had exited the balcony, a soldier with a tear gas gun shouted again at Mohammad to stop taking photos through the partially opened door. His final photo, above, shows a soldier aiming an M16 rifle outfitted for rubber bullets. As Mohammad turned to leave the doorway, this soldier fired a rubber-coated steel bullet which penetrated Mohammad’s cheek below the right eye and fractured his skull. Despite the seriousness of his injury, Mohammad remained conscious, and a friend who was in the room with him helped him down the stairs to the center’s front door. But with the soldiers still outside, the two were afraid to leave. After a few minutes, Mohammad, who complained of feeling dizzy and was afraid he was losing too much blood, wanted to leave to find help. But when they tried to leave the center, soldiers shot the door with more rubber-coated steel bullets. His friend shouted at the soldiers, “He’s dying! You killed him!” When the soldiers allowed them to open the door and saw the blood covering Mohammad’s face, they retreated a few paces and allowed the two to leave. The two then fled on foot into the refugee camp, where they found someone with a car to take Mohammad to the hospital. His camera, now stained with blood, remained in his hands until they reached the hospital, where his friend took photos of his condition—but only after Mohammad helped him to adjust the settings to get a proper exposure. He was soon transferred to the Bethlehem Arab Society for Rehabilitation hospital in Beit Jala, where he underwent two surgeries to remove the bullet lodged in his face. Though the bullet fractured his cheekbone, and further surgeries will be required to repair the damage, he is expected to make a full recovery without serious permanent damage.